The Detroit Red Wings have named their new captain Henrik Zetterburg he will replace the retired Nick Lidstrom as captain. The announcement comes as a little surprising, the Red Wings official made the announcement last Thursday before a scrimmage at Compuware Arena in Plymouth. The 32-year-old Zetterberg has been an alternate captain for the Red Wings. The Swedish forward had 22 goals and 47 assists last season. Zetterberg helped the Wings win the Stanley Cup in 2008 and won the playoff MVP for the 2 way player that he is. Lidstrom took over as captain after Steve Yzerman made a 2 decade run in hockey and is the longest serving captain in NHL history. 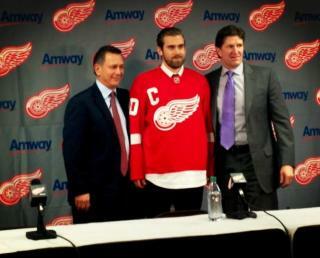 Lets see what Zetterberg can do for the Detroit Red Wings.